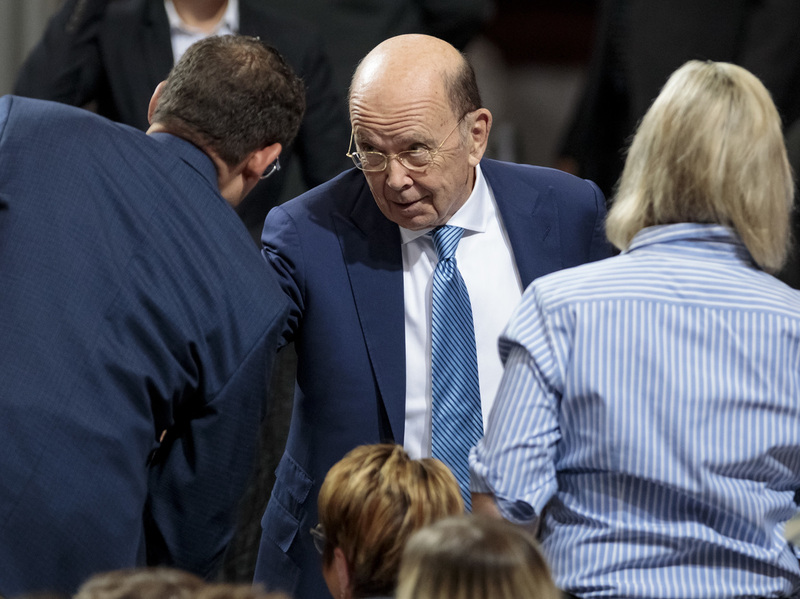 Census Citizenship Question: Supreme Court Blocks Wilbur Ross Questioning In Law The court granted the Trump administration's request to temporarily shield Wilbur Ross from facing questioning under oath in challenges to the 2020 census citizenship question. Commerce Secretary Wilbur Ross attends a July speech by President Trump in Granite City, Ill. The Supreme Court has temporarily shielded Ross from having to sit for questioning under oath for the 2020 census citizenship question lawsuits. The Supreme Court has temporarily shielded Commerce Secretary Wilbur Ross from having to sit for questioning under oath in the lawsuits over a controversial citizenship question the Trump administration added to the 2020 census. In a separate concurring opinion for Justice Clarence Thomas and himself, Justice Neal Gorsuch described a lower court's order allowing "a trial to probe the Secretary's mental processes" as "highly unusual, to say the least." Released on Monday, the court's order allows the administration to file additional requests for the high court to permanently block Ross' deposition. In a written statement, Kelly Laco, a spokeswoman for the Justice Department, called the order "a win for protecting the rights of the Executive Branch." The agency is representing the Trump administration in these lawsuits. "The intrusive and improper discovery in this case disrupts the orderly functioning of our government and is, as Justices Gorsuch and Thomas noted, 'highly unusual,' " she wrote. "The Department of Justice is committed to protecting the rule of law and looks forward to further proceedings before the Supreme Court." The administration's request to temporarily block other lower court orders for the lawsuits, however, were not successful. The Supreme Court is allowing the plaintiffs' attorneys to question Justice Department official John Gore, who leads the department's civil rights division. The administration argues that division needs the citizenship question to better enforce the Voting Right Act. Document requests from the plaintiffs can also move forward as the start date for the first potential trial over the citizenship question draws closer. In a written statement, Amy Spitalnick — a spokesperson for the New York state attorney general's office, representing the plaintiffs in one of the lead lawsuits — said the plaintiffs, "welcome the Court's decision to allow us to complete discovery in the case, with the exception only of Sec. Ross' deposition." "We'll get to the bottom of how the decision to demand citizenship status was made, as we continue our case to ensure a full and fair Census," Spitalnick wrote in an email. New York is among the dozens of states, cities and other groups that are suing to get the question Ross approved for the upcoming national head count removed. The question asks, "Is this person a citizen of the United States?" The plaintiffs' attorneys are trying to prove that Ross misused his authority over the census by adding the hotly contested question. In his opinion from September that accompanied the lower court order allowing the questioning of Ross under oath, U.S. District Judge Jesse Furman wrote: "Secretary Ross must sit for a deposition because, among other things, his intent and credibility are directly at issue in these cases." Gorsuch, however, wrote in his separate opinion that the plaintiffs have not presented enough evidence of "bad faith" from Ross to justify an inquiry into his motives. "There's nothing unusual about a new cabinet secretary coming to office inclined to favor a different policy direction, soliciting support from other agencies to bolster his views, disagreeing with staff, or cutting through red tape," Gorsuch wrote. He also indicated that the high court is "likely" to grant any additional requests from the administration for the court to permanently block Ross' deposition and other discovery requests that go beyond the record of emails, memos and other internal documents about the citizenship question that the administration has already released. This latest development, after weeks of legal back-and-forth over the depositions of Ross and Gore, puts pressure on the plaintiffs' attorneys preparing for the first potential trial over the citizenship question. That trial is expected to start on Nov. 5 in the U.S. District Court for the Southern District of New York. The deadline for evidence gathering for the two lead lawsuits in New York passed earlier this month. Gorsuch noted in his opinion that the trial in New York may have to be postponed if the Trump administration asks the Supreme Court to hear the case. On Tuesday, the administration asked Furman to pause preparations for the trial until the Supreme Court resolves the petition the administration is planning to submit. Furman issued an order Friday denying that request, noting that delaying the start of the trial, "could make a timely final decision next to impossible." Furman also pushed back against Gorsuch's and Thomas' conclusion that the plaintiffs have not made a sufficient case that Ross is acting in "bad faith." "The Court found reason to believe that Secretary Ross had provided false explanations of his reasons for, and the genesis of, the citizenship question — in both his decision memorandum and in testimony under oath before Congress," Furman wrote. In anticipation of Furman's ruling, the administration's attorneys filed a similar request on Thursday with the 2nd U.S. Circuit Court of Appeals to delay the trial. A three-judge panel of the appeals court denied that request on Friday. The administration argues the Justice Department's civil rights division, currently led by Gore, needs the question on citizenship in the census in order to better enforce the Voting Rights Act protections against racial discrimination. Census Bureau research, however, suggests using the census to ask every U.S. household about citizenship status in the current political climate could discourage noncitizens, including immigrants living in the U.S. illegally, from taking part in the head count. The Constitution requires the federal government to count every person living in the U.S. — regardless of citizenship status — once a decade. Those numbers determine how many congressional seats and Electoral College votes are distributed among the states after the census. An undercount of households with noncitizens could shift political power, as well as portions of an estimated $800 billion a year in federal funds, away from states and local communities with high noncitizen populations and toward those with smaller ones.